"There was a time when the stars themselves lived and died at our command. When the mon keigh races fled before us, as we transcended flesh and learned the secrets of the universe. In those days we were unmatched, unchallenged and immortal. There was nothing to fear, for we were glorious. But, as the mythology told us/tells us/always will tell, no matter the empire, no matter the power of your armies or the strength of your minds; no one can stand agaisnt the monsters you make yourselves..."
Hi everybody. I have a big idea; a new obsession perhaps delving into a rarely depicted but (oddly) always referenced section of the Warhammer 40K setting; the period of the Fall of the Eldar, and the years leading up to it. Basically, I envision a whole new setting, where we look over what info we have on the specific period of 40K history, and add the meat to this miniscule skeleton. I see two main threads of this project. The first would primarily be a thread for the actual background to the setting. Who are the main players on the galactic stage at this point besides eldar? What are they like? There would of course be hundreds of different human empires and corporations and stuff. Also other alien races which may not have been as prominent in the current setting as they were then. Tarellians, K'nib, Yu'Vath, Demiurg etc. For the Eldar there'd be even more questions and interesting things going on. What are the factions? what are the tensions between groups? Actual eldar would be awesomely powerful psykers virtually to a man, and they would be very diverse and with many eccentric characters and so forth. But also it'd be neat to create institutions and cultures unique to the old Eldar emprie that utterly vanished after the fall. The second fiction thread would be the primary story/stories set within this setting, which all form part of the story of the fall. I have started a story focussing upon how the phoenix lords came about, and I feel this'd be an interesting story to GS in itself. The post below this will have some notes and plans I was having for the setting. Apologies about the wording (with specific characters and stuff listed); they were originally meant for me to look through while writing a fall of the eldar story myself. however, I tihnk this'd be a much cooler project with multiple people's input and ideas. feel free to criticise or suggest changes to anything I've put; I have literally just created the bare bones of the setting there. I was jsut thinking where the current eldar institutions came from, and what their older ancestor-setting would be like. Here is some of my mad ramblings on the subject. Hopefully they are a bit coherent. The Gods can directly communicate with the Eldar at this time (or, the Eldar can actually summon warp entities which think they are their gods. Or perhaps both...), but this is only to a limited extent, through the actions of ‘God-Callers’-most powerful Eldar psykers in existence. -Eldanesh was the first and most powerful, and the ones after him have been progressively weaker. -Each Ruling Council is headed by a God-Caller. But the powers of the god-callers get weaker and weaker, as the Gods get harder to access. Worshipping Khaine is highly discouraged (to begin with? ), as he is still seen as the enemy of the Eldar. These are the main worlds that occupy the centre of the Eldar Empire, and are absolutely filled with billions upon billions of Eldar. The home world of the Eldar is Asuryana, and has three moons; one called Kurnous’s hunter moon (which is green and dull), Lileath’s maiden moon (which is very reflective and glows white, due to its polished surface) and Eldanesh, which is a moon with red soil and remains an ancient site of ruin; a legacy of the long distant War in Heaven. Other major inhabited core worlds are Eldannar and Ulthrannar, but there are hundreds more, including the Vaul moons, where the Ghost Warriors and most of the most sophisticated and powerful technologies of the Eldar Empire are made through a merging of psychic power with extremely sophisticated engineering overseen by Eldar inventors and enthusiastic hobbyists. The boring and hard jobs of the factories are performed by the mindlessly subservient Ghost constructs. The temple is a vast complex devoted to Khaine, and is hidden upon a war-scarred world. Khaine worship is forbidden to be practised openly, and hence it was hidden upon a minor world in the Empire. Asurmen and his brother are the first to find the complex in many thousands of years. Inside they find the remnants of Khaine’s old army; a force of suits of armour, in which countless followers of khaine were soul-bound. Several reactivate and they have to battle them desperately to survive. Khaine’s secret to binding souls into the ornate suits of armour, and Asurmen and his followers figure out how to replicate this concept for the building order of Phoenix Lords. The respository of eldar knowledge. A vast world ship which is constantly updated with the new learning of scientists, craftsmen and warriors. The white seers maintain the sanctity of the archive, and prevent the chaotic material stored there from getting out. Research into the Primordial Annihilator and daemons is constantly uploaded there. •	Lhethuni- Chief Thread-weaver of the Society of Old Ways. He is one of the curators of the repository. He is also the head of the Societies who try to maintain worship of the Old Gods. He later joins the Harlequins, after he finds revelation in the heart of the webway. He manages to get the repository into the webway, and the growing Harlequin faction hides it from all. The Black Library is born when Luminadrach is taken by Cegorach’s minions? Psychic network which can be accessed by all Eldar. Like infinity circuit but better? Some of the noble houses used codes to hide what they are doing, but when Vileth’s code is compromised by those on the side of the Ruling Councils, the other nobles start to acquire territories within the webway, as the webway is shielded from the Impulse network, and is hence ‘hidden’ in a fashion. Also, the webway was declared neutral territory, not controlled by the Ruling Councils. Various Eldar Mystical specialists of differing disciplines and powers rule over the Eldar core worlds, and their will is enacted through the various machines of the Empire, who maintain much of the machinery of the period. 99 councils, each representing one of the 100 swords of Vaul used by Khaine. Yaris is always absent, as it is the lost sword. •	Elumiier- A God-caller of Isha, who remains loyal to the old ways. •	Acheviir- One of a group of Eldar known as the ‘Entrusted Kin’, who have been given a license by the Ruling Councils to peer into the lives of Eldar of suspicion. They are increasingly unpopular with the highly independent Eldar factions, who resent having to do anything they don’t want to do. He tries in vain to defeat the Nobles, and tie them into the increasingly-destructive and monstrous pleasure cults. He does not leave when the last craftworld fights its way clear of the sensation barges that fill the system around Asuryana. He doesn’t leave as he rushes to try and rescue his child from the cults, who have been taking children and sacrificing them in obscene rituals. He manages to home in on his child’s psychic wails, and dies to free his child and the other children. Acheviir is killed by the Monstrous Drazziihr, one of Xelian’s minions. He is in turn slain by the adolescent Vect before he leads the children to safety. •	Kovan- a destroyer-mage (extremely powerful offensive psychic powers, but limited perceptional powers). She is an ally and assistant to Acheviir. •	Akkaeviir- One of the Ruling Council’s warrior-mystics. Warlock enforcers who are used to eliminate troublesome elements. •	Khervaniash- A member of the Ruling Council of one of the Eldar core worlds, called Eldannar. Slowly, he becomes reclusive and disinterested in the actions of Eldar under his council’s control. He becomes obsessed with his sensory chair on his Garden world located near the entrance to a major webway portal, allowing him to travel from the core world to his garden world almost instantly. He is consumed when the heart of the Eldar Empire is ripped out, as the Pleasure cults run rampant through the anarchy-filled streets of Eldannar. The Engineers of the Empire find themselves becoming increasingly redundant, and turn to creating artefacts of beauty and exotic items of arcane power, as the large scale technologies are taken over by the Constructs. •	Heisilaer- He is a master craftsman who develops the soul-tears, a special kind of gemstone which allows Eldar souls to pass through them, and emits wonderful soul energy that is immensely pleasurable. These are the pre-cursors to the casket of souls and the soul stones, and Asurmen purchases such a device near the start of the story (which is later used to channel his brother’s soul into his dire sword, to save him from Slannesh. He ends up creating some truly horrendous implements of soul-torment, but he is captured by the fleeing craftworld alliance towards the end of the tale, and forced to produce the soul stones for them. •	Resheek- An Eldar who dabbles in science, engineering and medical manipulation, and is obsessed with creating the singular, perfect sensation. Constructs special automatons on the request of Lord Kraillach, for inflicting pain and enhancing sensation. These are the pre-cursors to the Pain engines, and other flesh-tailors and twisted scientists begin to follow suit. •	Hrothine- A bonesinger and gate builder. He flees with the craftworld alliance, and teaches them wraithbone craft? Those who like to see the galaxy. They trade with other races, but not for profit (as they trade in only the very basic items of their Empire’s vast wealth, and have little use for the primitive technology of the lesser races). They travel to these worlds to learn of non-Eldar culture, in a condescending, anthropologist sort of way, like men investigating apes. They also bring technology to the Exodite colonies, who only ask for the bare essential technology required to make the harsh planets they live on habitable. The vast trading craftworlds are the Traders’ bases of operation. They also travel through Commorragh to trade their goods with other members of the empire and with the lesser races. They are a key faction that brings together those elements of Eldar culture who reject the new Dark Muses. They are a fringe group of Eldar who are always proclaiming the decadence and sin of Eldar society. Cult of Morai-Heg/Lileath perhaps? To begin with they are dismissed as flagellants and doomsayers who foolishly glare into the future and ignore the glories of the past and the wonders of the present. They are like a monastic order, travelling the streets of the core worlds bemoaning the foolishness of the Eldar race. Then, an Eldar known as Dunniashii, has a vision of utter annihilation on a grand scale; not just a moral decay, but a complete mortal collapse of all Eldar civilisation. All the other Farseers begin to have the same vision. While the conservative members of Eldar society think the Cults are a fringe group and that further decadence can be prevented through deterrence and censure, the farseers realised that they couldn’t stop what was coming, and the Ruling Councils would never let them abandon the Core of the Empire on the whim of distrusted oracles. Only one figure, a Craftworld Trader and generally an outcast from normal Eldar society, believed them, and begins to set up the Craftworld alliance through trading contracts and associations. Relics from the early days of the early, class-governed Empire, these houses are some of the most prestigious strata of Eldar society, and are granted control of vast territories by the Ruling Councils, who can keep an eye on them using their ferocious psychic ability. These territories are called ‘Marches’, which consist of their own personal worlds, and hundreds of systems, and they nominally rule anything within their lands (except for Eldar citizens), even the various xenos factions within their lands. They all had extensive ‘household guards’ who were essentially private armies of Eldar who were bribed with secrets and unique riches that nobody but the nobles could give them. The Nobles favoured living Eldar armies, as they could not be taken over by the Ruling Councils, and the Wraith-robots were forbidden from harming Eldar; they could only kill alien enemies. •	Marquis Vaulkheix- He is the Crowned ruler of House Thorn, and commands the Thornlords, a cadre of noble families. They possess the largest psy-lotus garden in the Empire, located inside the webway. He is vain and addicted to narcotics. •	Lord Xthuli- Reluctantly begins to indulge in depraved acts, to try and please his lover, called Linieth. He tries to curb to try and curb the children of his house’s excesses, but fails. •	Hierarch Ravandas- Xthuli’s eldest son and heir. He is a monster who murders and eats Eldar. To begin with Xthuli is disgusted with him, but still covers up for his son’s depravity. However, as society begins to fall apart, Ravandas starts performing hideous acts openly. His father eventually casts him out when Ravandas hands over his little sister to the rampant pleasure cults at the end of the story. •	Lady Linieth- High-ranking sister within the all-female Lhamaea pleasure cult, who is the spouse of Xthuli, and slowly seduces him into greater and greater excess. •	Urien Rakarth- He is a member of a group of flesh tailors; Eldar who can sculpt flesh into a variety of beautiful forms each more wondrous than the last (think a cross between a medical and plastic surgeon). He is supposedly the best in the Empire, and Lord Xelian is a regular client of his, and often travels from his estate into the heart of the Empire solely to partake of his abilities. Urien becomes bored easily, as his tasks have become mundane. He begins performing depraved surgeries on some clients, and gets many addicted to his pleasurable surgeries. Linieth is hooked on his specialised narcotics. Other flesh tailors begin trying to compete with him. They eventually have to relocate to Commorragh when Eldar loyal to Elumiier, a Ruling Councillor who still worships Isha (as he considers altering the Eldar’s natural form to be an affront to Isha’s act of creation. •	Lord Vokanna Bladerider- Chieftan and ruler of the house Saim-Hann, a Noble House which adopts much of the old ways encouraged by the Exodites as a fashionable affectation, and champion their rights at the council gatherings. He learns of the depravity of the house Kraillach, after he finds one of their secret torture dens within the city of Commorragh. He then convinces the other Wild Rider chieftains to join him in denouncing Kraillach, but lacks the evidence to prove to the Ruling councils what he is doing. Ignoring the decree of the Ruling Councils, the Wild Riders attack Kraillach’s corsairs in real space, who were in the process of torturing a mon keigh fleet. This earns the Wild Riders banishment, and they find and take over a craftworld when they are forced to leave their homes. A militaristic group of eldar who choose to put themselves into warzones on a whim. Perhaps liking the danger, or for wealth or for knowledge and inspiration found on the field of battle. A group within these armies eventually begins to see war as boring and clean and sterile, as everything is fought by the machines (known as Ghost Warriors), and the enemy is pre-neutralised before battle. Asurmen, Tethesis and Zain Zar are the first to notice this, and begin to perfect their own unique styles of combat as the wars continue, and try to involve themselves more directly in conflicts. They eventually form a band of trusted allies in battle (more than just the six originals. A small army), and take to utilising weapons crafted in imitation of the ancient Eldar weapons located in the museums; Fuegan takes up an axe, Asurmen a diresword, Arhra the demi-klaives, and so on. They begin to secretly see Khaine as an ally, and discover secret texts (in the temple and within Luminadrach) which depicted his role in the War in heaven as an ally of Asuryan (the Ruling councils portray Khaine solely as a monster, and have constructed him as a kind of devil-like figure). They help battle the xenos, daemonic and pleasure cult forces which begin to infest and pollute the Eldar Empire, but Asurmen secretly begins to build a cult of Asur based around Khaine as the supreme warrior; his discipline and skill would be a way to curb the cults of pleasure. •	Asurmen- Second oldest of the veteran warriors, after Tethesis. He actually locates the long-abandoned shrine to Khaine, and finds a vast, thousand metre tall statue of perfect metal depicting Khaine at its heart. This temple is destroyed when Slannesh awakes. When his brother is killed, Asurmen figures out how to save him by placing him into the Diresword, and vows to change the Asur from a cult of Khaine to one that fused the martial power of Khaine’s many aspects, with the immortal wisdom of Asuryan the phoenix King (much to Arhra’s secret loathing, which is not revealed until after the fall, when Asurmen also discovers the Father of Scorpions killed his brother). •	Tethesis- Asurmen’s brother. He eventually disagrees with the idea of following khaine, as he believes Arhra is what they could all become if they were not wary, and is slain by Arhra. •	Arhra- He only focuses upon Kaela mensha Khaine in his Aspect as a murderer and kin-slayer (as he is the killer of Eldanesh). Tethesis discovers this and challenges him over it, and threatens to tell Asurmen. Arhra believes this would tear their faction apart, and he slays Tethesis before he had learned the secret of the soul-suits. Arhra blames one of the Pleasure Cults’ daemon-constructs for the death. •	Maugan (later Maugan Ra). Rogue defector from the proto-harlequins? Perhaps he stole a death jester’s armour or used elements of his past heritage in his armour’s design? •	Zain Zar- Tethesis’ lover and eventual founder of the Banshees. She is mute, and only screams when she learns of his death. •	Tzvashi- One of the many Eldar who fight for pure fun and the enjoyment of tormenting and killing non-Eldar. She and her ilk, including Helica (a lethally-amorous proto-succubus) eventually form a proto-wych cult. They see Khaine as a murderer and embrace this, much to the annoyance of the proto-Asur. 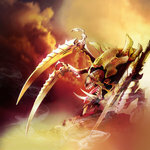 Dark Muses- Most are long-dead, and are only legends, but are becoming powerful warp entities and daemons in the warp. They are trying to orchestrate the birth of themselves. Vileth becomes one following his initial defeat. •	Vileth- He is an enemy early in the tale, but ascends to become a Dark Muse at a later date. A particularly anarchic and arrogant Eldar Lord, who disobeys the Ruling Councils explicitly. He is the primary antagonist during the First book of the Fall, and is slain at its conclusion. He inspires the other secretly-perverse Eldar, as Vileth argues that the Eldar, as rulers of all, are above worship and obedience to anyone but themselves , and the only responsibility they had was to enjoy their lives. The story can toy with the idea of who is really the villain; Vileth for desiring freedom, or the Ruling Councils for trying to control who can rule. He is undone because he cannot hide his actions from the ruling Council’s psykers, who discover it is he who tried to get the Ruling Councils assassinated, by using the Infinity Impulse, the psychic network linking all Eldar in real-space. He was using it to coordinate his minions, and was using a psychic code to mask his dealings, until it is cracked by his opponents. He is defeated by Arhra and Asurmen inside his inner sanctum. In his sanctums, it is revealed he has been capturing and studying daemons, and has bound many of them to eternal slavery. His ‘Draziin-Maton’ Annihilators were creatures made by siphoning off warp power and infesting ghost warriors with this power. He is eventually slain, but many of his arcane instruments are taken by his ally El’uriaq, who flees to the centre of the Eldar Empire with his former master’s prizes. •	El’uriaq. Second in command of Vileth’s grand estate. He is protected by Xelian, who sets him up in the sub-realm of Shaa-Dom, in the webway, to hide him from prying, Ruling Council eyes. These are eldar who willingly exiled themselves from the empire. They begin to develop the world spirits as part of their traditions to preserve their souls from the corrupting influence of their fellow eldar. They don’t want their souls to be merged with polluted souls in the afterlife. Ironically, this also protects them from Slannesh’s birth. They teach the methods of creating world spirits to the artisans on board the merchant fleets, who begin to construct similar networks for their eventual use. These are the proto-infinity circuits. A sect of eldar dedicated to fighting the forces of chaos. They wear black and bone armour, in imitation of the guards of Lumindrach (the Black Library). They do not fall to depravity due to their discipline, and take over one of the fleeing merchant world-ships (craftworld). Before they aligned themselves with a craftworld, they were Necron-hunters; the only ones left who cared about the old war. There’s bound to be something interesting about them. Maybe they were all sort of like rangers; vagrant wandering the fringes of the Eldar empire, looking for the Necron tomb worlds which have hidden themselves from the galaxy at large. I picture them having running encounters with the Triarch Praetorians at some point; however, the Praetorians are the ones on the back foot and are trying to avoid the attention of the Eldar empire, lest they be destroyed. Maybe one of the alien races the Triarch have moulded over the millennia have been sheltering them; honouring them as immortal metal gods. Aelin- She is an Eldar who falls for a mysterious incorporeal figure constantly shrouded in shadow. She eventually founds the Mandrakes somehow? Koriilish- Webway pioneer. Explores the hidden paths of the Webway during the story. (The webway is a vast realm, and to begin with the Eldar Empire only utilises the larger pathways and tributaries. Still has scars of the old wars? Dolmen gate ruins, lost passageways perhaps? Surviving old one constructs and creatures lurking witihn? Lots to explore). Koriilish plunges into the heart of the Labyrinth and communes with Cegorach, who completely alters her perception. Leave Cegorach’s nature vague? Vect- Just a child here. Not called Asdrubael yet, merely ‘Vect’. An innocent caught up in the height of the pleasure cults’ madness. Later escapes and is enslaved within commorragh. Karandras- A child rescued by Arhra as the proto-Phoenix Lords make a daring final raid upon the heart of the empire to rescue as many Eldar as they can. Me like. Me like a lot. I read through your thoughts and was flabbergasted at the level of epic it smelled of. I'd be glad to help with the project, LordLucan, especially the Human and minor Xenos empires - I've already got an idea for a Human Corporation and two Eldar Houses rattling around in my head. Just one question, would this be the "main" discussion thread you speak of? Yes, this would be the dicussion thread. Annual Profits: Unknown. Current estimates place it near 600 Trillion credits. History: Founded in 274.M18, Turring Industries was established by Owain Turring, a young, wealthy, nobleman from Terra. He set out and established his first business mining asteroids in the Asteroid Belts of Sol for the ship building companies on Terra. Using guile and wit, he managed to convince the other mining companies to join his own expanding business by purchasing their loyalty. Soon, his business was one of the largest mining operations in the system. The Warp Drive and Gellar field were both invented around this time. Using his connections in the ship building business, Owain was able to receive several Warp-capable ships. The ships traveled far and wide, establishing mining business to help the fledgling colonies and their STCs. Soon, Owain was wrecking in billions of credits. It was than the competition sprung a trap. Augustus Mining was run by a Romulus Augustus, a young, and up-and-coming, businessman and nobleman. He was the talk of Terra's finest opera halls, theaters, and hives. His fame was great, and only his ambitions were greater. Using his influence, he slowly but surely built up a private, loyal army of mercenaries and a fleet of ships under his command. Augustus Mining had once been the premier mining corporation of Terra. However, Turring Industries ousted them during Owain's successful take over of the market on Terra and the surrounding system. Forced elsewhere, Romulus Augustus's father, Orestes Augustus, made a point of reminding Romulus as he grew up, why their family was in such dire monetary straits. Romulus, upon assuming power at his father's behest at the age of eighteen, turned inward. He consolidated power, concentrating on stabilizing his own house before vengeance. At the age of twenty-two, Romulus had saved his family's wealth and expanded his business. Money flowed into the family coffers like water into a cup. It was than, that Romulus plotted. Owain was an ancient man by this time. He had four sons and two daughters, all of whom were ambitious, strong-willed men and women. His daughters married well into other great corporations, securing two powerful alliances with the Alain Agricultural corporation, and the Hengest Pharmaceuticals corporation. Both had large fleets and armies at their command. Turring Industries had no fleet or army, for they, arrogantly, assumed none would dare strike at them. Owain's sons knew better. Ida, his eldest and heir, built up a powerful fleet. It was while he was inspecting his armada of cruisers and frigates that he fell to his death. Osric, Owain's second son, was immediately suspicious and alerted his father to his suspicions. Owain decided to visit the armada and told none but his family of his surprise trip. As his ship arrived in system, Owain was greeted with the sight of twenty vessels' broadsides. Before he could issue a command, or even contact the other ships, the fleet opened up. Owain's ship was obliterated. The Turring armada had gone renegade the official documentation stated. Osric, now the head of the corporation, knew better. He called upon his allies in Alain Agricultural and Hengest Pharmaceuticals to help him. They obliged and, after years of investigations, following shadowy footprints in the bureaucracy of ship records of ownership, and other dark trails, at last they had discovered who it was. Augustus Mining had a massive fleet and army, and a grudge. They had also had an official meeting in the Eadmund system, where Owain was slaughtered, two Terran days before. Plus, the ships that Ida had bought had once belonged to Augustus Mining's private flotilla. Knowing what had to be done, Osric prepared for war. His companies stock had been plummeting ever since Ida and Owain's deaths. Like Romulus before him, Osric rebuilt his own corporate empire first. As his stocks rose, so too did Osric's army. His fleet expanded and soon, he had enough forces to take on the Augustus Mining. It started off quietly in 476.M18. Osric's navy slowly chipped away at Augustus Mining's fleet of civilian trade vessels. Augustus Mining stock fell. Enraged, Romulus sent out his ships and attacked Osric's trade ships in retaliation, for who else could be so bold? Using this as his excuse, Osric called upon Alain Agriculture and Hengest Pharmaceuticals. Together, their combined fleets destroyed the Augustus Mining Trade Fleet. Augustus had his military armada raze Turring Industries planetary headquarters to the ground wherever he found them. Billions of innocents died, weeping and crying, as Romulus's orders were misunderstood. Instead, the fleet bombarded metropolis after metropolis on nearly every world with a Turrin Industries base. Osric was disgusted. Leading his army, he personally assaulted August Mining's headquarters planet. He engaged an erratic Romulus who seemed to quaver and shake every other moment. It was than Romulus screamed and unleashed a psychic blast, incinerating Osric and Osric's guard. Taking a small craft, Romulus took one of Osric's ships and fled the system, disappearing into the void of space. Cool start mate. I like humanity being an intensely commercial entity in this period; everything is for sale, and everyone is trying to screw everyone else forever. Psychotic galactic capitalism! I like the Turring/Augustus back-stabbing and double-dealing. Now we need to recruit more folks to really get some momentum behind this. I am interested in this, Lucan, if you would have me? Probably do something Eldar related; I've took a real liking to them as of late. Sure thing Dark Angel. Happy to have you. Actually, on second thoughts, I’m going to go for another of the Old Ones Races - The Rashan. Thinking of making them a cousin-race to the Eldar, with most of the traditional hallmarks, being tall, slender and graceful, but with several considerable differences; most notably shimmering skin, enlarged canines and multihued eyes. Though, you would only notice these differences if you stared long enough - The skin especially, it's more of a rippling, like water but with the texture of marble, smooth and utterly devoid of warmth. I imagine them starting out as allies with the Eldar - Though as the timeline progresses, - The Rashan become evermore distasteful of their cousins, particularly with all of the pleasure cults business, before escalating into conflict. Alternatively, the conflict could come after or before the Fall of the Eldar, for sake of ease. The Rashan will never be as numerous or as powerful as the Eldar, though I do imagine them to be the more warlike of the two species. I’ve got two characters in mind, - Meraxes Startreader and Elammakil Bright-eyed, - The Rashan equivalent to the Phoenix Lords, more will come on these pair of dastardly individuals later, though. I have a very basic outline of Rashan society jotted down in my head; including military and religious aspects, which tend to intermingle somewhat. Before I get started, however, I would like to know what you guys think of the idea? I like the rashan being like eldar but different. Slightly unnerving and weird cousins who nevertheless seen the Eldar as misguided. perhaps they have a more exodite-like lifestyle, and the exodites copied them when rejecitng decadence? Wars between the Eldar and Rashan would be interesting, I’m sure, - Considering that they are both physically and technologically similar, - Though the Rashan lack the ability to create Craftworlds and other Wraithbone constructs. Maybe they advance roughly at the same time, slowly growing evermore divergent from one another? I like the idea of the Rashan before conservatives; I could definitely imagine them to be a bunch of egotistical isolationists, upholding their original virtues - Mistrusting of other races, xenophobic even. Perhaps the Rashan encouraged the Exodus, in an attempt to salvage what was left of the Eldar race? HQ: Triple: Noctis Labyrinth, Mars, Canis Majoris, Fenris and Gorgon, Medusa. Mercantile Focus: Goldman Corp. is a massive shipping interest, its dockyards build the ships of a hundred navies and its own vessels carry out much of human trade. Goldman also carries out roughly 30% of human manufacturing, with a heavy focus on weapons, armor, medical devices and home electronics. Immense profits derived from these pursuits fuels research into bleeding edge medical fields, from cybernetic implants to the synthesis of artificial organs, to state of the art terraforming and warp travel technology. Goldman Corp was formed millennia ago, in the chaos of the Dragon War when old earth burned and left Terra in its place. Merican soldiers left stranded in Mesopotamia by the nuclear destruction of their homeland were recruited by the enigmatic Anatolian businessman Casr Araka, who foresaw that the world would need the remaining energy reserves of the Middle East when it emerged from the atomic apocalypse. Using these immensely powerful military formations, Araka carved out well ordered holdings throughout Western Asia and Europa. He and his descendents ruled this empire as benevolent kings, forming a small cluster of order in a mad world where logic and science were valued instead of the insane superstitions growing throughout the rest of the world. Technological progress soared and by the time the surviving Sericans and Mericans had rediscovered writing, Araka’s empire was already relaunching primitive satellites and building nuclear power plants. As human society rebuilt itself, the Arakans gave freely of their technology and practices, vastly increasing the pace at which mankind recovered. Unfortunately, this meant that the Arakans lost their hard won technological edge and came off worse in several wars, their holdings shrinking to Anatolia. However, by this time (roughly the 4th Millennia by the reckoning of the Cruxian calendar) the Arakans had already constructed permanent and self-sustaining fortresses on both the Earth’s moon and Mars. Mars was slowly terraformed over a thousand years, made into an ecological paradise on the surface. Beneath the ground, the Martian Arakans began a burst of creativity never seen on earth. New devices and techniques were invented by the day: powered armor, artificial intelligences directed energy weapons, fusion power plants of increasing power and decreasing size. As Mars’ population climbed, the Arakan Emperor (Temujin Anathame) ordered the construction of vast ‘cold ships’, these vessels could fly through the void at nearly a quarter of the speed of light, while carrying millions of cryogenically frozen humans. The first of these ships had set out in the early 6th Millenium when war broke out between Mars and Earth. This war would be different than the one between the Terran tribes and the old Arrakan Empire. The primitive Terran ships were allowed to land millions of invading soldiers and land hungry colonists from the over-populated and polluted earth before the Arrakan’s struck. Advanced Arrakan ships annihilated their earthling opponents with ease, their lance weapons and shields making them impervious to enemy attacks. On the ground the highly disciplined ‘Old Breed’ soldiers, descendents of Casr Araka’s Merican mercenaries, slaughtered their Terran foes. Armies in power armor, backed by enormous tanks and sentient machine walkers, surrounded and butchered the near helpless Terran soldiery until they surrendered. Captured settlers were herded into highly secure camps, where they were treated surprisingly well by the supposedly godless Arrakans. By this time, Arrakan fleets had swatted away Earth’s defensive satellites and had taken bombardment positions. The Arrakan Emperor broadcast a simple ultimatum to the polluted world below: they could deliver their leaders for execution and accept passage on the Martian Cold Ships for new worlds or they could die. Within an hour the heads of the Terran states that had invaded Mars were delivered to an outpost set up by the 1st Arrakan Marine division (the ‘Dark Angels’) and summarily shot. Across the globe, Arrakan fortresses were set up where hundreds of thousands of desperate Terrans took passage on the Cold Ships for the distant stars. Millenia later and Goldman Corporation, the literal and spiritual successor of the Arrakan Empire of Mars, still retains immense power, indeed unrivaled power, within human space. Although other human federations and corporations seem to have comparable forces available, any who make war upon the Goldman Corporation quickly find how easily the Martians are able to subvert their technology, as well as to out think and outfight their opponents. The Old Breed divisions still exist, formed into twenty immense war groups consisting of thousands of ships and millions of men each. Any of these ‘legions’ is able to destroy many smaller human empires. However, as the 25th Millenium dawns, Goldman Corporation appears to be searching for something with increasing desperation. Marine divisions have assaulted seemingly random worlds, some isolated, some powerful, massacring the populace and departing, leaving only corpses and immense excavation sites. Rival corporations specializing in artificial intelligence research have been assaulted both militarily and politically, what is not bought is burned. In some cases war with outlying Eldar worlds has even occurred, hundreds of thousands of Marines and hundreds of warships dying in hours just so small teams of scientists can quickly loot alien artifacts and flee before the unstoppable alien response. Inhabitants living near Goldman research institutions report bizarre dreams of plague, blood and mutation. One especially disturbing detail that is found in each report are messages from seemingly divine beings, unerringly matching the reporters religion, claiming that, ‘The God(s) are dying’ and pleading for help. Human and alien governments have found several disturbing words repeated in the few Goldman Corporation messages they can decipher. Thousands of partially broken communiqués reference a ‘throne’ and the search for it, although exactly what the ‘throne’ is remains unclear. Other memos mention the words ‘Machine’ ‘Uprising’ and ‘Soon’ with disturbing regularity. Frontline reports that the number of Marines is growing immensely, both in sheer numbers and in percentages of the total force. A number of AI units, even some of the immense and invaluable Olympian Legions, in the Goldman armed forces have apparently gone missing. The Goldman Corporation is clearly attempting to prevent some terrible event. The consequences of their failure are too terrible to contemplate. Mars remains the headquarters of the Corporation and is still the foremost site of human innovation; no other world or corporation is able to match the flood of invention that pours out of Mars annually. It was here that the first sublight engines were invented and millennia later the first warp drive engines were built here. The most reliable means of interstellar navigation, the genetically altered Navigators, were first bred in Mars before escaping to the galaxy as a whole. Mars itself is an ecological paradise on the surface, covered in productive sustainable farms and gorgeous wilderness. Beneath the surface lay immense forges, factories and research facilities unmatched in human space. Much of the population lives in orbital housing blocks, commuting to the surface to work via reliable teleporters, except for the high ranking scientists in their red robes. Mars’ population is huge and it is heavily defended by Marine units and Olympian Legions. Fenris: A warm, tropical planet, Fenris is the ‘northern’ of the Goldman Military. With the exception of the Imperial Fist Legion that permanently garrisons Goldman holdings on Earth and the Lucky 2nd and 11th that garrison Mars, most of the Legions are rotated through Fenris to serve as a trip wire against any incursions by the massive Eldar Empire. ‘Wolf pack’ raids against Eldar worlds also are sent out from Fenris and as a consequence the planet is heavily fortified, especially the Canis Majoris mountain chain. Medusa: a tectonically active world hostile to human life, Medusa is used for wargames by the Goldman military and for weapons research by Goldman Scientists. Debris litters the spaces between the lava flows, some of it older than humanity. Caliban: a mysterious pastoral paradise, Caliban serves as a testing ground for advanced research into the warp. Although immense amounts of money are poured into the planet, nothing world shattering is expected to be produced here.